The Oakland A's announced Thursday that they have hired four design firms to lead the design process for their plan to build a new baseball stadium near Laney College. The A's don't yet own the proposed site, which is located between Lake Merritt and Interstate Highway 880 and currently is home to the administrative offices for the Peralta Community College District and includes commercial warehouses, parking lots and office buildings. Project opponents, including neighborhood groups, small business owners and Laney College students and faculty, have said they're concerned about traffic congestion, pedestrian safety, parking availability and the possible loss of affordable housing in the area. In an apparent attempt to address those concerns, Oakland A's President Dave Kaval said, "Our goal is to create the best ballpark experience for our fans, players, and community. 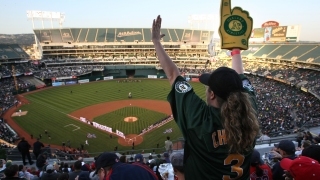 It is critical for our ballpark to truly integrate into the fabric of Oakland." Kaval said in a statement, "All of the firms are industry leaders and have reputations for leading award-winning transformative and cutting-edge projects. We look forward to working with them to develop a project that works for our entire community." The A's said Sasaki, a design firm based in Boston, Snøhetta, which is based on Norway but also has a San Francisco office, and Oakland-based Studio T-Square will lead master planning and urban design efforts and will assist the baseball team in the community engagement process. The A's said HOK, a global architectural and planning firm that has an office in San Francisco, and Snøhetta will collaborate on design of the new ballpark and its interface with the master plan. James Miner, Sasaki's principal in charge of the project, said, "A key component to making this project a success will be an active and meaningful engagement with A's fans as well as with the broad and incredibly diverse community of Oakland." Miner said, "We want the ballpark to be a great place not only for baseball, but also for the community and the environment." Snøhetta partner-in-charge Craig Dykers said, "With its new home closer to downtown Oakland, the project will re-invigorate the relationship between the A's and the city as a new kind of ballpark that acts as a center for sport, wellness and culture." Dykers said, "We look forward to working with the team and the residents of Oakland to create a vision that will not only continue the rich legacy of the A's, but also strengthen communities, foster healthy habitat, and build a vibrant new cultural heart for the city." Chek Tang, the president of Studio T-Square, said, "As part of this community, we are excited about the Oakland A's vision and commitment to create a world-class ballpark and development that will bring further revitalization to downtown Oakland." He continued: "Our design mission is simply: to bring the A's motto 'Rooted in Oakland' to reality by featuring the history, legacy and winning tradition of our beloved A's and proudly celebrate and display the cultural diversity, community pride, true grit and natural beauty of Oakland." For his part, Brad Schrock, the regional leader of sports, recreation and entertainment for HOK, noted, "The new ballpark is a transformational opportunity for the city of Oakland and the A's to create an architectural icon and completely re-imagine the fan experience. "We're looking forward to collaborating with the A's and our design partners to create an imaginative, amenity-rich and enduring community asset."